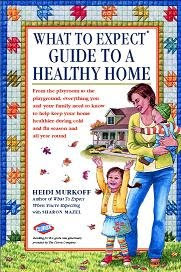 Heidi Murkoff, author of the bestselling What to Expect series, has written a new 16-page book What to Expect: Guide to a Healthy Home. It is full of easy to use tips and practical advice on how to keep your whole family and home healthier. • Set up small changing stations with baby wipes and diapers in multiple rooms in your house to make diaper changing easier on you... especially if you have multiple floors. • Disinfect frequently-touched surfaces in the home – such as doorknobs, light switches, and hard toys – with disinfecting wipes to help prevent the spread of germs. • If a stuffed toy isn't machine-washable, put it in a plastic bag in the freezer overnight to help get rid of dust mites.